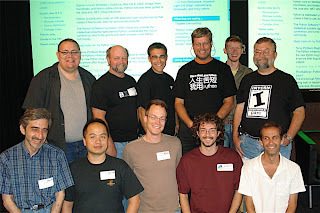 Google was pleased to host last week's Python Sprint. From August 22-25th, over twenty developers in Mountain View and Chicago came together to improve next generation Python, also known as Python 3000 or Py3k. Many of the participants got their initial taste of Python internals at the sprint. There was a flurry of activity at the sprint, and over 100 changes were committed - about five times the normal rate! The team got so much done that you can expect the first alpha release of Py3k in a few days. If you'd like to participate in Python development or just learn more about the project, check out their general developer's mailing list or the Py3k development mailing list.